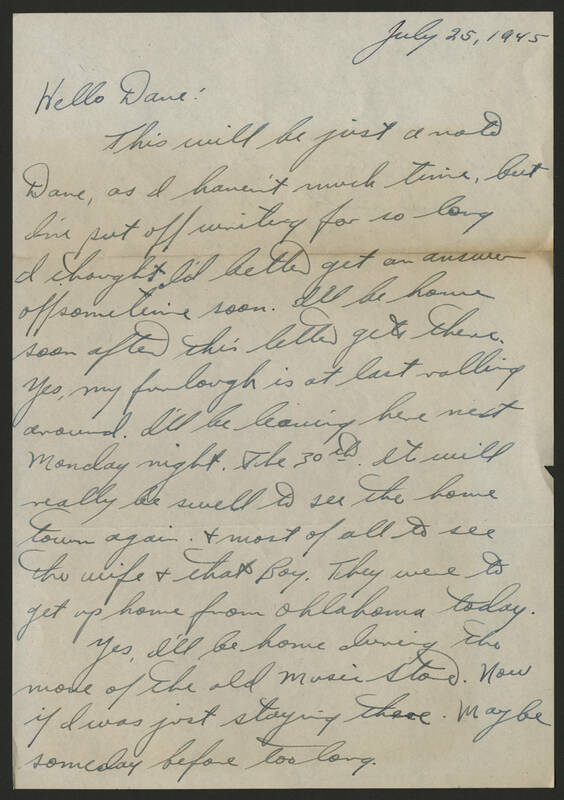 July 25, 1945 Hello Dave: This will be just a note Dave, as I haven't much time, but I've put off writing for so long I thought I'd better get on an answer off sometime soon. I'll be home soon after this letter gets there. Yes, my furlough is at last rolling around. I'll be leaving here next Monday night, the 30th. It will really be swell to see the home town again and most of all to see the wife and that Boy. They were to get up home from Oklahoma today. Yes, I'll be home during the move of the old music store. Now if I was just staying there. Maybe someday before too long.